Shopping cart development nowadays is complicates with the race for innovations and desire to have strong position in competitive market. Thus, eCommerce development companies actively search for new ways of attracting traffic and offer more to the potential customers. 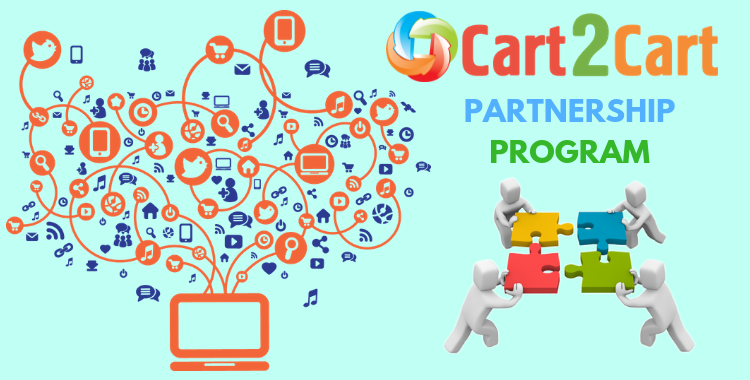 Cart2Cart partnership program can open new opportunities for business development in such case. As soon as merchants come to the decision of replatforming they start searching for shopping cart that can satisfy their needs. Suppose, they find your cart suitable, and want to establish store on it. However, question they immediately face is how to move store to a new shopping cart without errors and with minimal downtime. And this question can prevent merchants from changing their current platform and becoming your customer. With Cart2Cart you can offer your clients not only a shopping cart to establish a store, but also a service to transfer their database from old store automatically. Such 2-in-1 option is more attractive, and provides you with competitive advantage. From the previous example you can see how Cart2Cart helps you win strong position on the market. However, there are more benefits you can offer to your customers. 100% store uptime is also what you can guarantee to your customers because Cart2Cart requires no downtime and the old store continues working, while data is moved to a new one. These benefit will be definitely appreciated by merchants who are interested in quick and safe store migration. So you will be able to convert potential customers to the satisfied buyers, using Cart2Cart migration opportunities. Cart2Cart is constantly developing service, and we help our partners to develop as well. New migration options are added and the available functionality is improved to provide you with high quality standards. Support and technical engineers are available via online chat and support tickets, so you can get consultation, be informed on migration progress and get assistance with any issues. The price of each migration can be estimated previously. So you will know the exact price of each customers migration. You will deliver store migration to qualified specialists and at the same time increase your revenue. Cart2Cart offers beneficial discount program to its partners. Still hesitating? Let us dispel your doubts. Get in touch with us and discuss migration questions or business opportunities you are interested in.